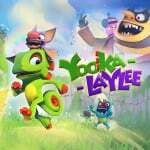 Yooka-Laylee has already been out for a while, but that doesn't mean developer Playtonic Games has completely moved on from the chameleon and bat duo - in fact, the British studio is hard at work on the previously teased '64-bit tonic' mode that demasters the whole game so it looks like it's running on Nintendo 64. The mode serves of one of the many Kickstarter stretch goals the game's crowdfunding campaign smashed in 2015. Oh, if you've yet to pick up a copy on Nintendo Switch, now's the time as it's currently 25% off on the eShop. But only for another two days, so be quick! Bearded malcontent Dom has been writing about games for so long he's practically forgotten what reality looks like. Over his career he's written for just about every site and mag out there. You'll almost always find him catching Pokémon or yelling at dragons in Skyrim. I...don't see much of a difference? Nice. Still waiting to give the game a shot because Limited Run Games are releasing a physical copy in August. Until then, i’ll have to wait. Where is the first look? Just that one blurry screenshot? Quite a misleading headline. That looks a little bit too good. I don't see much of a difference. Yookan't tell the difference either. @Bunkerneath I haven't been keeping up on that. Is there any word or updates on when it's coming out? I think Playtonic bit off more than they can chew with this tonic. Going for a true N64 look would require essentially re-making the entire game. They would need new low-poly models and low-res textures for everything, and that is a lot of work that's just unfeasible. They should have just made a low-poly skin for the main characters (like Odyssey did with its Mario64 outfit) and leave it at that. This game is a huge letdown for me, had high hopes but those ex-Rare stuff stuck in 90's gameplay wise. Wish I can sell my digital purchases. @Bunkerneath Well geez...that's coming up real soon and still no preorders yet? Seeing how early they've done preorders for their other switch games, it's hard for me to believe they're keeping that release window. Anyways, thanks for digging that up for me. Still deciding on whether or not I even want the game. Wish there was a demo. While it is not a terrible game by any means, it is not the greatest either lol. Oh my god I didn’t know this was happening! I love this game so this is great news for me! Also, isn't this game getting a physical release at some point? Another YL plug by NL. As others have said, this doesn't even look like an N64 game. Missed opportunity. I don't think what the headline says is what we're seeing in that shot. Nothing like that would be possible on N64. But to be fair, accurately simulating that system's limitations is a pretty crazy challenge. And certainly the video clip in the tweet is just the regular game. @Julien Another bitter comment by J on NL about YL. @Pod https://www.playtonicgames.com/bits-and-pieces/ Unfortunately yes it is lol. Their official article. Good thing not every markets are focusing on nostalgia and old stuff. I wouldn't like to have a demastered version of my car without radio, bluetooth, airbags, seatbelt, armrests, headrests, starter, etc... just for the sake of nostalgia. @Rhaoulos Horse and buggy. The ultimate car demaster. Just making it blurry doesn't make it look N64ish. That looks like a mess. Sure there was some blurry in N64 games but Banjo was not that bad. Looks like a waste of time imo if you're not going to do it right. That really doesn't look N64 at all, which is weird considering they got it right with Rextro. Still so far what I've seen of he game (didn't get it on Switch afterall...caved to a sale), but I'm really loving it. And I'm not even an N64 purist. I don't get the overall negative response to it. Still way too many poly's for that to be 64-style. For starters, those vines and bushes need to be replaced with sprites a la Mario 64, or reverted to muddy textures on the tree. No physical copy = no purchase! Doesn't even look like an N64 game more like a gamecube one. I'm going to need at least a fifty percent discount before I'll bite, and even that won't be ideal. And yeah, that's an N64 game as seen through some high prescription rose tinted lenses. I fail to notice any discernible difference? I dont understand why anyone would want low res textures anyway. Don’t you read reviews, watch preview videos and weight people’s comments before buying anything? Can’t complain if you didn’t do your due diligence, and if you did well, you’re the only one responsible for that buy. Suppose for those that love CRT filters on things like the NES/SNES Mini, it might be your thing. These guys of all should know what N64 games looked like. This is just phoning it in. @Joker13z Yeah... it's cheesy, but still funny. So, you didn't notice that, when you visited that page yourself before you posted it in your comment? @oji The 90s gameplay was much better than that of Yooka-Laylee. This is a letdown for level design and gameplay mistakes. They can do much better than this which is probably why we should support their work. Waiting for the game to be good before I purchase it. @gauthieryannick, in most cases I do, but for this title I made an assumption on my previous experience of good old RARE's games. For sure it's my mistake, should never ever trust even credible developers. Someone once said about all the nes rom hacks online. If they can’t actually run on real hardware your not really making nes games. I’d love to see them release a version for the n64. Especially if they were able to make something that tops Conker or Perfect Dark in pushing the system to its limits. I honestly thought this was just a picture from the game. When I realized that it was actually the female I started to say to myself it looked more like a GameCube game but then decided the poly count of the characters looked too high for that even. Whoever above said it looks like an SD Xbox 360 game hit the nail on the head. If someone leaks the n64 version of Starfox Adventure (Dinosaur Planet) or Eternal Darkness then I’ll be impressed. so....they just lowered the texture quality....well thats lazy. @Stocksy Yeah, all they said as per their website and tweets is ‘August’. I assume that means pre-order and sale. I also asked them about how many copies will be made. They said for Yooka Laylee it’s supposedly going to be a 2 week window and they’ll make the amount that is ordered. They’ll also ship internationally. For now, just keep an eye on their website and twitter, that’s what i’ve been doing every few days or so. I really want to get this game on Switch. But even on sale, it's like $40 in Canada. I could've bought it on Steam recently for about $20. The eShop "sale" price is almost like the full price of the PC version. lol! I understand the Switch release of the game is more recent than on PC, but really, these type of things are whats preventing me from buying more games on Switch, as I ALWAYS feel like that, even when on sale, I'm not getting a good deal. I wouldn't mind paying a bit more (as the portable aspect is a plus to me), but not that much. The Switch, to me, is right now the current platform where the value for your dollar (what you get per dollar) is the lowest of all, when comparing the same games on all other platforms. I still love my Switch. But man, this "Nintendo tax" makes it hard to love it as much as I'd like to. So not even a filter this guys can make.